Not unexpectedly, Sunset Hill home prices were the highest, with a median sale price of $888,000. Sunset Hill has some beautiful homes with panoramic, west facing views of the Puget Sound and the Olympic Mountains. And of course, amazing sunsets. If you're not fortunate enough to own a home here, you can always go to Sunset Hill Park at 34th Ave NW and 77th for unobstructed views of nature at its finest. Between 32nd and 24th Ave NW, the median price was $768,000, between 24th and 15th it was $803,000 while for the Whittier Heights area between 15th and 8th it was $747,000. To be honest, I would have expected prices to have shown a continuous upward trend going from east to west and not sure why the area between 15th-24th is higher than 24th-32nd? Previously, when I have run these numbers I have seen an obvious east-west upward trend. Note that there were only 17 single family home sales in Sunset Hill during the past 6 months. Ideally, there would have been more sales to generate even more reliable data. For the other 3 Ballard areas, there were between 73 and 106 sales. For all 4 Ballad "sub-neighborhoods", on average, homes sold for more than the listing price by between 4.9% and 5.8% which is the sign of a strong seller's market. Is there any difference between ballard Seattle home prices for north Ballard and downtown Ballard areas? For Ballard real estate, there is an obvious transition in the type of homes as you cross over NW 65th Street. Below NW 65th Street, the majority of homes are townhomes and condos. The zoning in this area is mostly Low Rise-1 (LR-1) which means homes can be built with up to 3 stories. Also, this zoning allows for higher building density. Above NW 65th Street, the zoning is mostly Single Family-5000 (SF-1000) which means that that only houses can be built and only one home can be built per 5,000sf of land. In this part of Ballard, most of the new construction is big, boxy, modern million dollar price range homes. Developers/investors love the lots south of 65th Street because they can buy a little old Ballard single family home that has been there for a hundred years and then add multiple townhomes and turn a tidy profit. The area below NW 65th Street has seen the most change in Ballard since the Seattle real estate and hi-tech booms began. This is also the area that is a quick stroll to the main Ballard hubs of Market Street and Ballard Old Town. 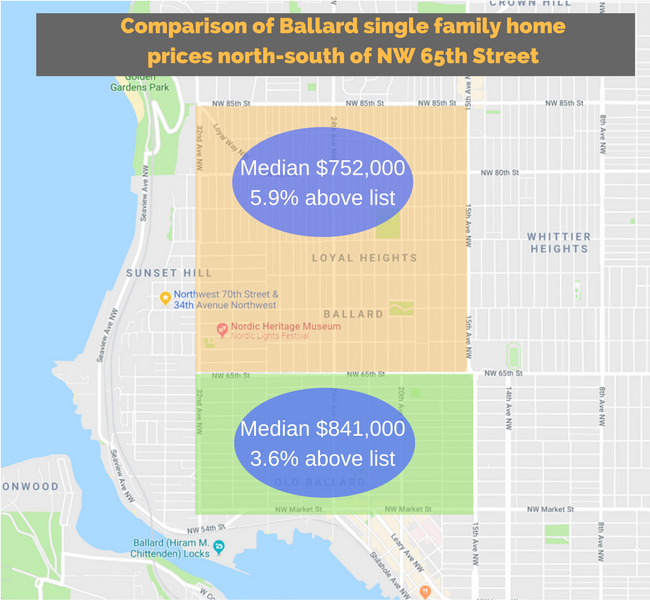 When you compare the median sale price of Ballard Homes north and south of NW 65th Street, prices were about $90,000 higher to the south. Besides paying a premium for close proximity to Ballard's social hubs, the difference in price is probably due to the greater percentage of modern new construction homes in this area. Some home buyers will pay a premium for a turnkey, new construction with less reliance on owning a car. In conclusion, as with most Seattle neighborhoods, home prices will vary in different parts of the neighborhood. 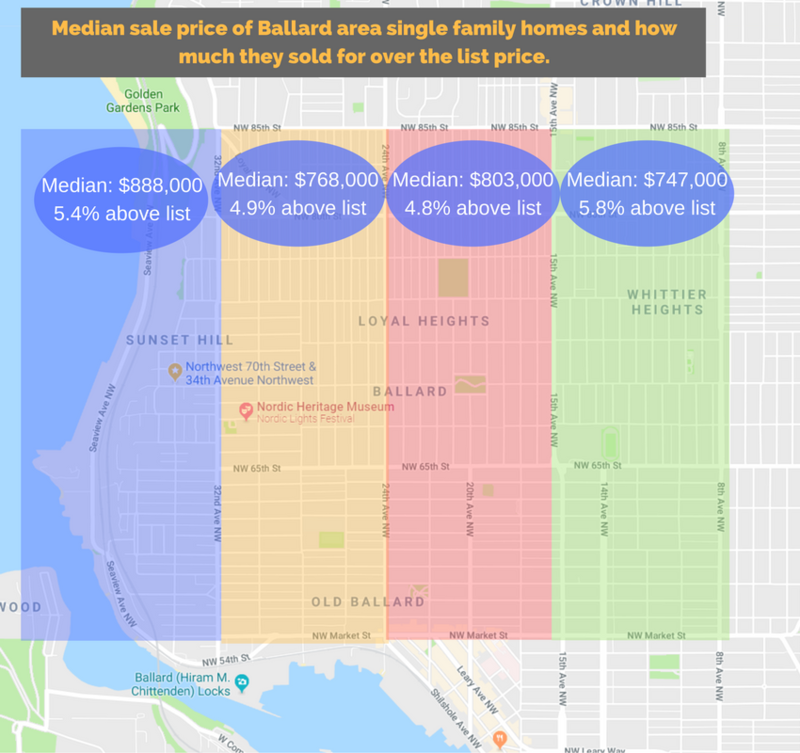 Based on the above data, you'll pay a premium for owning a Ballard Settle home that is closer to the water or is closer to Ballard's social hubs. What Percentage Of Homes in Ballard Seattle Are Bought With Cash? The 9 Critical Questions To Ask When Buying a Condo. The above article "If My Realtor Self Could Advise My Younger Buyer Self" was written by Conor MacEvilly. Conor is a Realtor living in the Ballard neighborhood of Seattle. He works with both home buyers and sellers in the greater Seattle real estate market and on and on the Eastside in neighborhoods like Redmond, Bellevue, and Kirkland.